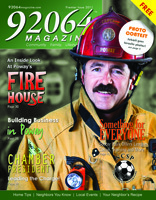 Hurry to reserve your advertising space in 92064 Magazine, a vibrant full-color glossy community magazine with 100% Poway information and features about local people and personalities. A publication that local residents WANT to read, it is the perfect marketing environment for Poway businesses and services. This is what everyone in the community will be talking about this summer!